This is the same ad, one geared toward the straight buyer, and the one next to it toward the gay buyer. The only difference is in the straight one, the woman's head appears, and in the gay one, her head is replaced by a disco ball. 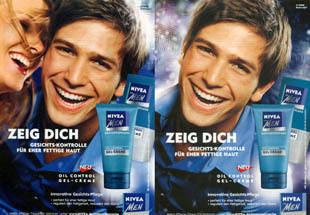 The text reads: "SHOW YOURSELF - Face control for rather oily skin."